AC drive applications can generally be divided into constant torque or variable torque. A variable torque application is one which is usually easy to start and requires more torque as the ac motor speed increased. Examples include Centrifugal Pump, Centrifugal Fan, and Low Viscosity Mixer. Constant torque loads require the same pushing or turning force (torque) at all speeds in the operation range of the machine. Typical examples are conveyers, hoists and positive displacement pumps. In a centrifugal pump or fan, affinity laws help us to understand that pressure is a result of the square of the speed, and power is a function of the cube of the speed. Using an AC drive on variable torque loads allows you to take advantage of these affinity laws which state: As the speed of a centrifugal load decreases, the horsepower requirement will decrease with the cube of the speed, Head Pressure will decrease with the square of the speed, while flow is proportional to speed. Soft start and stop, prevents water hammering in pump applications and prevents sagging of the power line from high inrush that would occur with across the line starting. Mechanical wear and tear on belts & drive train components such as gearboxes are reduced. If a valve or damper is used for process control by restricting flow, significant energy savings can result by using an AC drive instead. If 2-speed motors are utilized, some energy savings can be achieved. Limiting speed when temperature changes occur in the air stream can control fan loading. Better process control than dampers or valves. Utility companies and the HVAC application have widely accepted that AC drives save energy when applied to centrifugal loads. The figure below demonstrates how an AC drive can dramatically save energy when used on a fan or pump with variable flow rates. 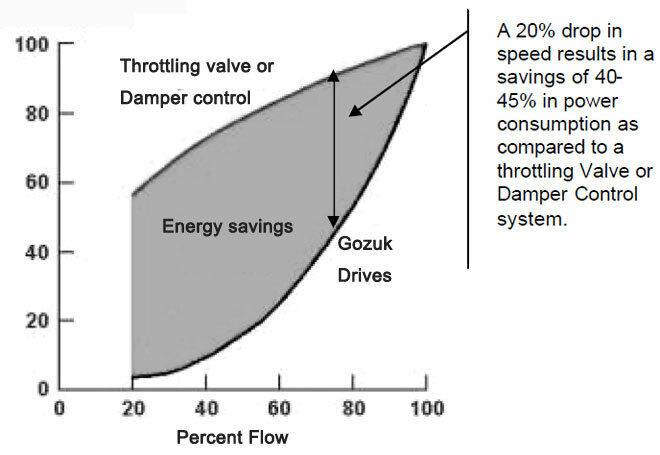 The power savings and system efficiencies are much greater than those that utilize 'throttling valve' or 'damper control' for flow control. In order to take advantage of reduced power consumptions at lower flow rates some Original Equipment Manufacturer's (OEM's) have chosen to use two speed motors. Two-speed motors do help reduce power consumption at the lower speed, however these special motors cost more, only provide two operating speeds, and have significant reductions in performance values. On 2-speed motors the motor design is a compromise in that the winding is optimized for only one of the two speeds. For example a 1800RPM/900RPM motor, the winding design is based around the 1800RPM winding, the 900RPM winding performance values are sacrificed significantly, therefore seriously affecting the overall system efficiency. Furthermore, both power factor and efficiencies are lower than the values of a single speed design, for both the 1800RPM winding and especially the 900RPM winding. We can use an AC drive system instead of the two speed motor. AC drives are becoming very common in most industrial applications. AC drives have advanced with many improvements and are now very application insensitive. The HVAC industry have adopted AC drives because of their ability to significantly reduce power consumption during off peak times. Other applications use them for speed control purposes, and even fixed speed applications are considered for AC drives to allow large motors to start and stop more often. Furthermore the advancements in Vector control have improved performance so much so that DC equipment is rarely considered if not required at all anymore. With caution for voltage stress and bearing currents, an AC application with a high quality motor and AC drive can give years of reliable performance with virtually no maintenance.